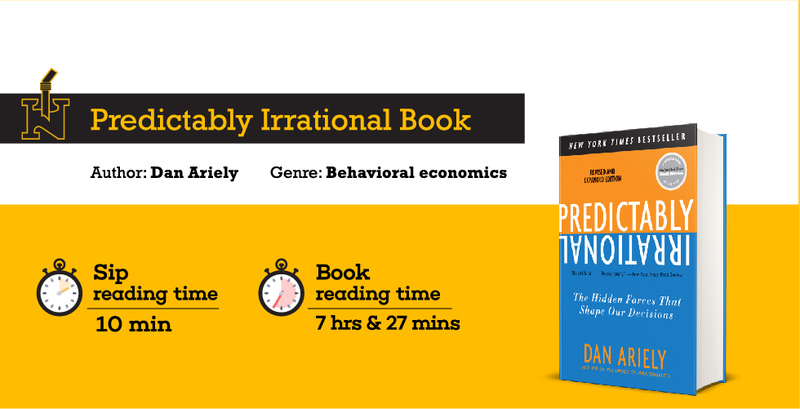 Predictably Irrational is one of the books that could benefit everybody. Dan Ariely excelled in proposing his ideas as well as experiments. The experiments done by him in this book was both cool and clear. Readers of this sip will gain a great knowledge of how expectations, emotions, social norms, and other invisible, seemingly illogical forces skew our reasoning abilities. We consistently overpay, underestimate, and procrastinate. We fail to understand the profound effects of our emotions on what we want, and we overvalue what we already own. Marketers — Business People — Psychologist — Creative Communicators — Consumers — Self-development Readers. Questions answered by this book. • Why do our headaches persist after taking a one-cent aspirin but disappear when we take a 50-cent aspirin? • Why does recalling the Ten Commandments reduce our tendency to lie, even when we couldn’t possibly be caught? • Why do we splurge on a lavish meal but cut coupons to save 25 cents on a can of soup? • Why do we go back for second helpings at the unlimited buffet, even when our stomachs are already full? • And how did we ever start spending $4.15 on a cup of coffee when, just a few years ago, we used to pay less than a dollar?